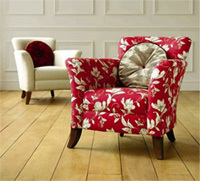 Imagine the finest classic, or contemporary occasional chairs each covered in the luxury designer fabric of your choice. These side chairs would look great in any room, perhaps in the corner of your bedroom or kitchen-diner. They always look great in a study or a snug. And if you have the space, an occasional chair can transform a landing or corridor in a usable and comfortable part of the home. You can click on an image below to learn more about any chair. Once you see an accent chair you like, you can select a fabric from our Designer's Choice and then securely and quickly order on-line. Can't see your perfect chair?